Fill a large saucepan with water about 3/4 full. Finely mince about a heaping 1 tablespoon of the onion; set aside. Place remaining onion, garlic, bay leaves, 2 tablespoons Worcestershire, salt and black pepper along with chicken into water. Bring to a boil, reduce heat and simmer 20-25 minutes or until chicken is cooked through. Combine the remaining Worcestershire, ketchup, mustard, molasses, maple syrup, vinegar, chili powder and cayenne in a small bowl. Heat canola oil over medium-high heat in a small skillet. Cook the minced onion 2-3 minutes or until begins to soften. Stir in sauce ingredients and bring to a simmer. Cook 3-4 minutes to thicken slightly and for flavors to blend. Season to taste with salt and black pepper. Transfer cooked chicken to a bowl and shred meat with two forks, discarding bones and skin. Toss chicken with sauce. 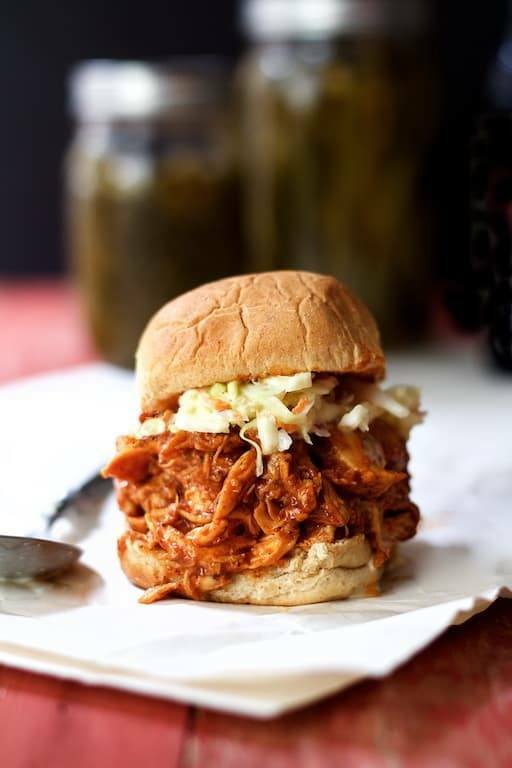 Serve immediately over slider buns with your favorite coleslaw.